Yummy! We'd look out for these, not sure if they have it here. Sure looks like those treats were a big hit. Thanks for telling us about them. We love the video. This reminds me of when we tried that food for a review this spring! The girls totally turned up their noses at that old gruel that we'd been feeding them before! *rolls eyes* I love it when you find something that the dogs really take a liking to! 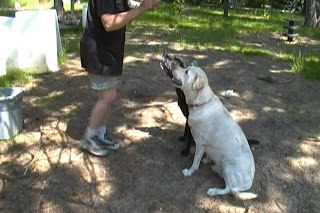 The video does not lie...those treats were a HUGE hit! We are going to talk momma into taking advantage of the special offer and trying some. YUM! With only two healthy ingredients in each flavor, they sure do look like good treats! Great review! I second it! Our samples from our review went fast too, and the recent goody bags we received afterward are almost gone too! I told Nala we'll have to ask mommy to BUY some of them for us, they're so good! Who was that headless woman;) Loved the video. Another awesome looking treat for the kids that we can't get here:( I think we're going to have to shift to the USA! My kids are so deprived living in New Zealand, lol.